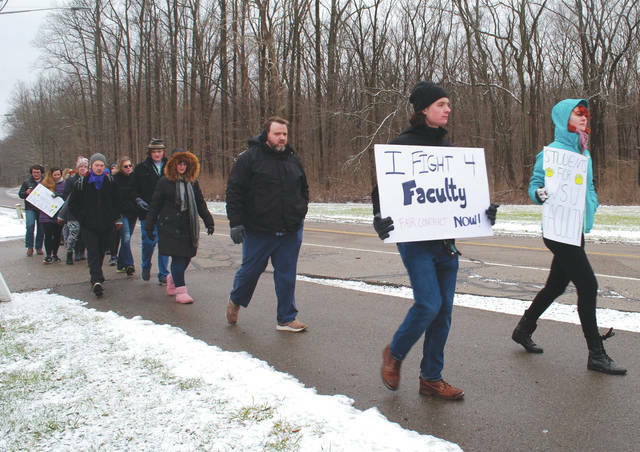 Whitney Vickers | Greene County News Some Wright State University students marched the campus Jan. 24 in favor of the American Association of University Professors - Wright State University Chapter. FAIRBORN — The Wright State University Board of Trustees are scheduled to meet in an executive session Friday, Jan. 25 in which collective bargaining is the item on the meeting agenda. An organization called “WSU Students for Faculty” sent a press release to local media members Jan. 23 that said Wright State is discouraging media from speaking with students and that the college is censoring students’ social media accounts by deleting comments made on WSU posts. The press release additionally included that “sweepers” and replacement professors have made threats to students, as well as other accusations. WSU said Jan. 23 that additional bargaining unit faculty members have reported for class. WSU added that 99 percent of classes at the Lake Campus have continued and that no classes at the Boonshoft School of Medicine and School of Professional Psychology have been impacted. The Wright State University Student Government Association held a press conference Jan. 23, where SGA President said some classes are being held on a self-study plan basis on the college’s online portal. Wright State also said in its press release that students should continue to attend their classes but is aware that some discipline areas are being impacted more than others. Whitney Vickers | Greene County News Some Wright State University students marched the campus Jan. 24 in favor of the American Association of University Professors – Wright State University Chapter. 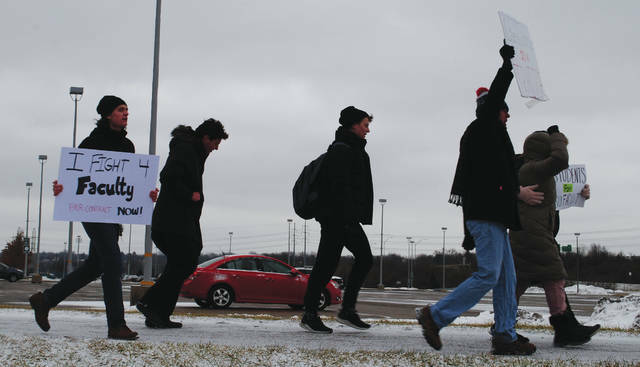 https://www.fairborndailyherald.com/wp-content/uploads/sites/50/2019/01/web1_studentstrike1.jpgWhitney Vickers | Greene County News Some Wright State University students marched the campus Jan. 24 in favor of the American Association of University Professors – Wright State University Chapter. 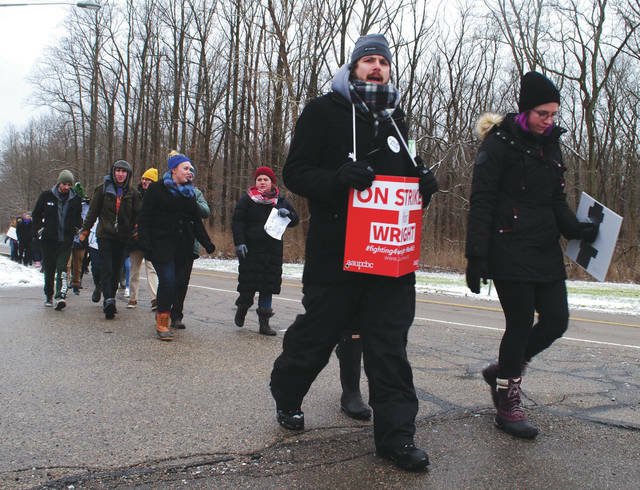 https://www.fairborndailyherald.com/wp-content/uploads/sites/50/2019/01/web1_studentstrike2.jpgWhitney Vickers | Greene County News Some Wright State University students marched the campus Jan. 24 in favor of the American Association of University Professors – Wright State University Chapter. https://www.fairborndailyherald.com/wp-content/uploads/sites/50/2019/01/web1_studentstrike3.jpgWhitney Vickers | Greene County News Some Wright State University students marched the campus Jan. 24 in favor of the American Association of University Professors – Wright State University Chapter.